Enjoyed watching you bake a cake. 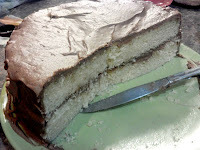 I've had great success "flipping a cake" out of the dutch oven if it is heavily greased. A generous wiping of Crisco will do the job. I let the cake rest for 5 minutes or until the cake starts to release from the sides. Using mitts I turn the oven over onto a round platter and the cake springs out. The key is do it while the oven is hot. Just thought I would share. Thanks for all the great ideas!